Compare prices on car hire in Alicante Airport from all the major brands and find the best deals. When you book through us, unlimited mileage and insurance are always included in the price given. Alicante Airport (ALC) is located 9 km southwest of Alicante . There are good bus service between the airport and Alicante. There are 10 different car companies at the airport, these are National Ates, Record, Sixt, Auriga, Centauro, Avis, Hertz, Solmar, Goldcar Europe and Europcar. 9,139,607 passengers visited the airport in 2009, making it the 6th busiest airport in Spain after the number of passengers.It is the main base for Ryanair which accounts for roughly a quarter of passenger traffic (2009) followed by Easyjet. The airport has two terminals and a terminal 3 will be completed in 2011. 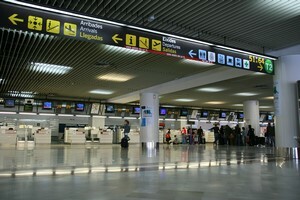 There are several bars, cafes and restaurants at Alicante Airport. It has three different duty-free shops and several specialty shops selling everything from music to jewelry and sporting goods. Other amenities include a pharmacy, internet, medical and pharmacy.